I wrote this script many years ago when I needed a simple CAPTCHA generator for use with the classic ASP ASPJpeg component. At the time it received a lot of interest and while obviously almost obsolete these days, I have posted it for anyone looking for something like this. If you’re thinking of making the jump to PHP – which I have – I thoroughly recommend this book: Beginning PHP4 (Programmer to Programmer) – clear and programming oriented (none of the waffle you see in other beginner books). Note: If you’re working with ASP components, you might find my Classic ASP Component Detection Script useful. Simply save this code in an ASP file using whatever file name you prefer – I generally save it in a file called imageVerification.asp – we will call this as an image using (see the form example below). When a page loads and calls this script, it generates an image on the fly and stores the code that is displayed in that image in a session variable called verificationCode – this can then be evaluated on whatever script/page your form submits too. 'Written by Bob McKay, please leave copyright intact. 'Copyright Bob McKay 2009. All Rights Reserved. IF wantBorderRoundCodeBox THEN drawBorderRoundBox '					If a border is wanted, draw one. This is a simple login form to illustrate how this could be used. failureReason = "Incorrect verification code. Please enter the code displayed in to the 'Verify Code' box." This is a *very* old piece of code so I’m not really that familiar with it anymore! Which font are you using and is ASPJpeg installed? 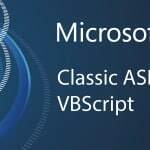 I’m afraid not as Classic ASP is really a legacy language, this article was written almost ten years ago (it pains me to say that because it was my first love as far as server side languages go!). Sorry I’m not understanding – what about Canvas?